It wasn’t until the fourth century AD that the Medieval world was introduced to monastic life, in the form of a devout Egyptian Christian named Pachomius that thought it was a good idea to have an isolated space to be humbly miserable and to worship God at the same time. His concept spread rapidly throughout the Eastern Roman Empire, and with it, his expectation for all monks to be literate. About two hundred years later in 529 AD, Benedict established Monte Cassino, a soon to be a famous Italian monastery close to Rome and Naples, and took literacy one step further than his predecessors. His Rule of Saint Benedict provides some guidelines for monastic life at Monte Cassino, including a section called “On Daily Manual Labor,” where reading is one of the compulsory activities built into a monk’s very regimented schedule. Soon after, Cassiodorus founded Vivarium in South Italy, and pushed for more than just idly reading texts--he made copying them yet another compulsory task. Suddenly, as per popular adoption of Cassiodorus’ Institutes rule book, copying texts of all kinds became an important (and highly pretentious) part of life in monasteries. He saw copying biblical texts as spreading the message of the Christian religion and “fighting with pen and ink against the unlawful snares of the devil” (ch. 30), which seems as noble a purpose as any for devout monks to perform daily as part of their grueling manual labor. And trust me, it was grueling. The process of medieval copying, however biblical or holy, was highly taxing. Cassiodorus’ over-enthused attitude about copying the good word was certainly not shared by the scribes that actually did the copying in monasteries, but that was in fact the point of manual labor. Cassiodorus pours over correct and precise copying techniques and suggestions on how to improve your grammar and spelling in Institutes, showing just how detailed and systematic copying became during this time. Because of these close details, copying texts required great skill and tons of training on the behalf of the scribe, and finishing a single copy could take weeks, even with long hours devoted only to writing. 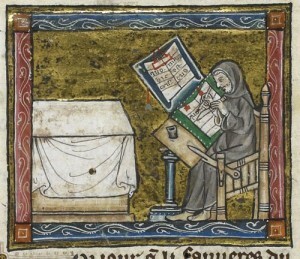 A monastic scribe would work for at least six hours a day, and the best ones would work more than that; Cassiodorus specifically exempts the best of the best from daily prayers so they may have more time to work. Those round-the-clock special scribes also graciously received an abundance of candles and a clock, so they may work past sunset and watch their life slowly tick away while they toiled. 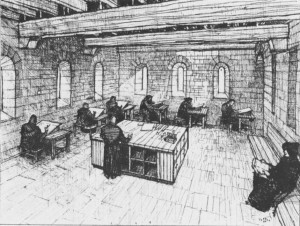 A single room of the monastery, called the scriptorium, acted as the workshop for scribes and was usually isolated, mandatorily quiet, and not very comfortable. Monks who worked under these conditions frequently suffered from acedia, a “foul darkness” that causes the affected to act anxious, apathetic, and hopeless, “as if the sun was too slow in setting”--in other words, clinical depression (Greenblatt 2011, 26). Often scribes would express their anguish in the margins of a manuscript they copied in the form of little pleas of mercy. One even writes, at the end of his script, “Now I’ve written the whole thing. For Christ’s sake, give me a drink” (Greenblatt 2011, 40). 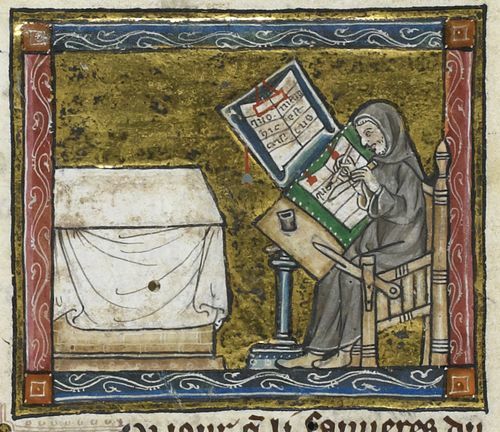 The length of the text was far from the only problem for medieval monks tasked with copying. Since all manuscripts were copied by hand, some form of human error corrupts them, whether it is skipping over words (or perhaps entire lines), misspellings, false interpretations, or hypercorrections. Even the best of scribes could easily succumb to any of these errors by accident, corrupting their manuscript without knowing, contributing to the confusion of present scholars trying to figure out what the original manuscript said. Because of the commonality of these errors, the exemplar the monk would copy his own manuscript from could possibly contain major flaws, unavoidable in his own script even if he himself made no mistakes. Of course, monasteries did their best to avoid all corruptions, implementing a rule that monks were only supposed to copy what they saw on the page (and not try to correct the errors they may or may not have seen in their exemplar), but this did not protect from all corruption, especially when monks didn’t understand the text in front of them. Language barriers frequently separated a monk from his exemplar. A Latin speaking monk may be asked to copy down a Greek text, but even if the text was in Latin, it was a very different form of Latin than what he would be used to. By the middle ages, the Latin language had regionalized and evolved into something that was nothing like the archaic Latin of Ancient Rome, both in grammar and syntax, much like the difference between modern English and Middle English. Some people thought this was for the best; Poggio, a major (and enthusiastic) figure in copying culture during the Renaissance, believed that understanding the text was not favorable, as it would introduce the possibility of more hypercorrection errors because monks would feel more comfortable correcting their own language. This would make the manuscripts more precise in their readings, but may be dangerous if a scribe was unable to recognize if he himself made a major error in copying a foreign language. Past the physical pen-to-parchment copying of the text, the rest of the book production process was equally as difficult and specialized. 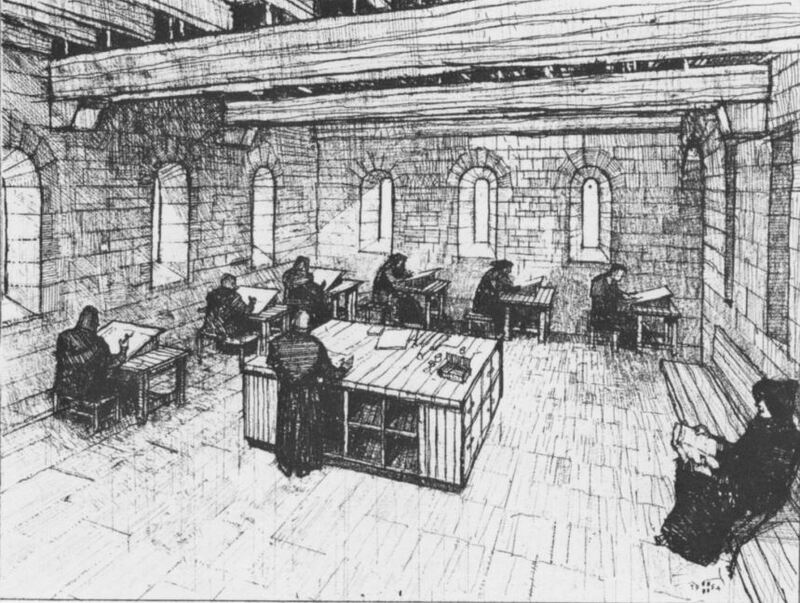 Scribes, illustrators, and book binders would often be separate in their professions, because of the level of skill and amount of time needed to adequately perform each part of the process. The scribe would copy a text, then hand it off to the illustrator (if there even were illustrations, usually only seen in later manuscripts), and then it would be given to a binder to be sewn together at last. This process took copious amounts of time as well, not just because the tasks in themselves are time consuming, but the book also may have had to travel to different monasteries or workshops in order for illuminations or bindings to be completed. 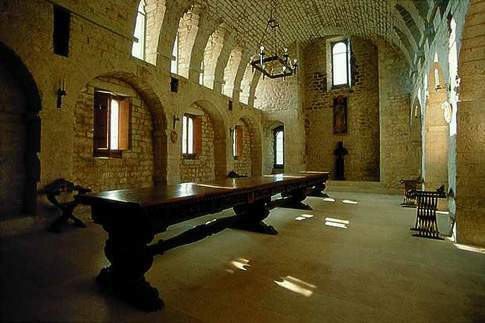 Despite these literary pursuits majorly dominating monastic life, the reading culture present in monasteries was not a positive reinforcement of a love for the written word so forced upon the monks. Reading and copying were indeed treated as manual labor, and that added a negative connotation of and intense distaste for reading. Benedict’s Rule creates daily silent meals, where no one was allowed to speak for any reason, other than the “weekly reader”--the person in charge of mandating a certain holy book or other to the entire dining room (ch. 48). Even the weekly reader’s enthusiasm for reading was crushed, because the rule dictates that the reader should pray to God for salvation from pride in his important task of reading to the masses. Still, for some reason, monks kept on copying. From the start of the boom in copying practices in the fourth century AD, Greek and Latin mythical and literary classics were the predominant texts copied up until about the sixth century, when Christian texts started to replace them due to the rise of the Christian religion. Here the “dark ages” of Greek and Latin literature descended upon ancient manuscripts, neglected on monasteries’ library shelves, not to be copied because of newfound disinterest in them as compared to Christian texts. This neglect caused the older manuscripts to decay faster than they normally would, because no one was particularly interested in their well-being. Some pagan manuscripts were even reused for writing new biblical copies down, because of the high cost of parchment. The old ink would either be washed or more commonly scraped off, and the new text written over, to create a “palimpsest”--literally Greek for “scraped again.” Most manuscripts from antiquity don't survive to the present day because of these and other natural causes. Some interest in pagan literature still survived, of course, in the Greek Byzantine Empire, where the people never truly stopped caring about their ancient mythology, but got close to forgetting about it for awhile. What manuscripts survived only survived because of the strength of the papyrus or parchment they were written on, until about the mid-eighth to the early ninth century, when a classical revival took place. This was the Carolingian Revival, when the first Holy Roman Emperor Charlemagne reinvigorated the learning spirit in monasteries across the empire. He recruited major scholarly figures and poets from around the world to gather at his palace, which became a center for scholarship with its vast library of Charlemagne himself. Monastic libraries once again flourished and copying of Greek and Latin classics restarted, this time on an unprecedented scale under Charlemagne’s reign. Illumination finally came into use, although very archaic (literally borrowing motifs from antiquity) at first with limited colors, but breaking out into elaborate designs seen in canon tables in copies of the Bible and colored initials to start the major lines of a text. Special scholarly editions of manuscripts also started to be published, with scholia, or commentary paratext, taking up stretches of the page longer than the actual text itself. The Ninth Century Renaissance in the Eastern Byzantine Empire mostly focused on this newfound scholarship, with the founding of literary and poetic groups and the re-founding of schools in major cities. The Carolingian Revival is the single most important event in classical literary history, because of this sudden extreme interest in classical texts that were copied and spread like wildfire. This single-handedly saved ancient texts which do not have any surviving manuscripts from antiquity, making the Carolingian Era manuscripts the only surviving and most important texts we have. It is because of those book productions in the medieval world that we have most of the Greek and Latin classics we have today, which just may validate all the hard work done by scribal monks living quietly in the far remote reaches of society so long ago. Benedict. Rule of Saint Benedict, Chapters 6, 38, 48. Guidelines on how to be a good scribe. For reasoning behind adopting copying as a monastic activity and how it was done, this is the best source contemporary with the relevant time period. Casson, Lionel. Libraries in the Ancient World. New Haven: Yale University Press, 2002. Casson’s book provides in-depth information on the early history of monasteries and their spread throughout the world, including their mission statements, major figures and their respective monasteries, and most importantly, their libraries. For more information about not only monastic libraries and their traditions and inner workings, but all major ancient libraries, this is an excellent source. Greenblatt, Stephen. The Swerve: How the World Became Modern. New York: W.W. Norton, 2011. Greenblatt focuses on the development of copying and what it meant for monks and the monastic world as a whole. His book contains the story of Poggio, the famous copier of the Renaissance period, and his studies in manuscripts and copying techniques and ideals. Reynolds, Leighton Durham, and Nigel Guy Wilson. Scribes and Scholars: A Guide to the Transmission of Greek and Latin Literature. Oxford: Clarendon Press, 1974. Reynold’s work is an overview of Medieval book culture, and contains excellent information on the Carolingian Revival and the Ninth Century Renaissance, among most other things related to the Latin West and Greek East empires. It is such an excellent information about ancient world.Go back historical background i met with useful information about it's process.The revival exhibition was informative although the process is available of production.